This is a view of a band marching in a N.W.K.A.A. parade in Oakley, Kansas. 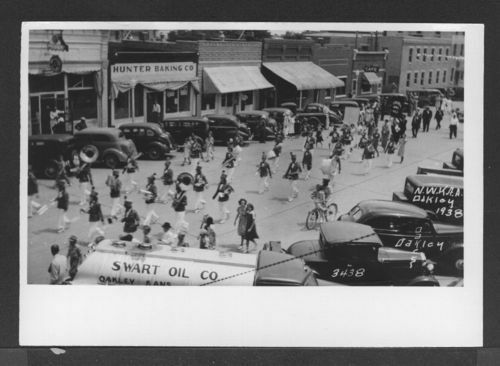 Also visible are spectators,; two people on a bicycle; parked automobiles, including a Swart Oil Company tanker truck; streetlights; and buildings and businesses along the city street. The Hunter Baking Co. and a cafe sign are shown along with a number of unidentified businesses.